You may be surprised to hear that most people don’t equate job satisfaction with financial reward. In fact, they say that job satisfaction for them is feeling like they are a valued part of a team. Family business leaders should acknowledge their team members for the quality of their work and their contributions to the business. In fact, they say that job satisfaction for them is feeling like they are a valued part of a team. Family business leaders should acknowledge their team members for the quality of their work and their contributions to the business. Often managers forget to encourage and reward team members so they stay motivated and engaged. This may actually occur more with family business teams. After all, why should you reward your sister for fulfilling her role in the family business? Shouldn’t being part of the business and having a share in its’ success be reward enough? Not necessarily. In the day to day activities the companies’ “future goals” are probably not enough to keep her motivated. So what can you, the family business leader, do to inspire your team? Motivation is often just using some type of common sense. Here are 10 ways to inspire your family team to be motivated and engaged. After all, why should you reward your sister for fulfilling her role in the family business? Shouldn’t being part of the business and having a share in its’ success be reward enough? Not necessarily. In the day to day activities the companies’ “future goals” are probably not enough to keep her motivated. So what can you, the family business leader, do to inspire your team? Motivation is often just using some type of common sense. 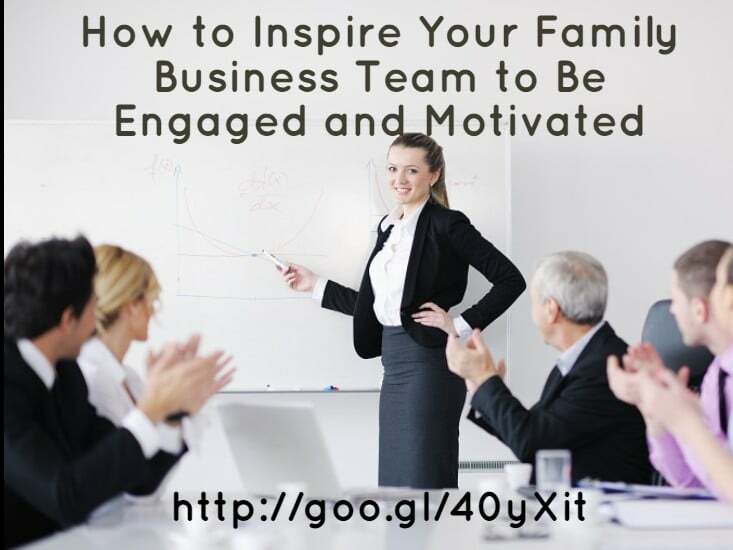 Here are 10 ways to inspire your family team to be motivated and engaged. So what can you, the family business leader, do to inspire your team? Motivation is often just using some type of common sense. Here are 10 ways to inspire your family team to be motivated and engaged. Keep your promises to them. As the family business leader, you should know each family member’s role in the business and what the return is for each person. Your family expects you to make sure they receive what the family agreed upon. Things like pay, working conditions and job security are basic expectations. To maintain job satisfaction and stay motivated, people seek challenges to help them grow and learn. Don’t use fear as a way to motivate. Making your family members fear the loss of their part of the family business will only lower morale and energy levels. Use their creativity as a motivator. Give your family members projects that engage their own creativity. Don’t be too strict and formal with your rules. Even a family business needs clear standards that are written and agreed upon by the family team. They should be applied fairly to everyone in the business but leave a little wiggle room as well. Know your team member’s personal goals and values. Do you really know what Uncle Mike’s goals and values are? What does he do outside of the business? If you don’t know, pay attention to what he does outside of work. Have a conversation with him to discover his goals. This will let you see how you can inspire and motivate team members. It will demonstrate that you value them as a team player and in turn, you will gain their respect. Outline clear career paths for each team member. This is a good topic for a family meeting. Watch this video with Coach Pete Walsh to learn how to hold a great family meeting. Make sure your team members have what they need and want. How do you do this? Simply ask. Don’t assume they have all the tools and training they need to effectively fulfill their job duties. Make sure they also have the support they need from you. Family businesses are often worse at communication than traditional businesses. After all you and your brother grew up together, shouldn’t you know everything about him? Often the total opposite is true – you don’t know anything about him! Keep an open door policy, offer training sessions, and regular family meetings. Encourage all family members to ask questions if they are confused about something. Take a look at this video about how to have better communication in your family business. Your job is not much different than a Little League coach. Give team members positive feedback in a way that encourages them to continue to do better. When negative feedback is necessary, be sure to do it in private. If you discuss problems with other team members present the person receiving the feedback may feel singled out. Lastly, don’t forget to say “Thank you” to family members when they do a good job. Treat all your team members the same way and with respect and trust. Family businesses are often inclined to having members who feel that the family business leader is “playing favorites.” When you treat all family members equally you can alleviate some of this. Use your best judgment and experience when problems arise. When you make a mistake apologize and admit you’re wrong. Your team members will relate to this and you will earn their respect for being honest. When work is fun people will be more relaxed. They will get more done and not even realize it because they are enjoying it. So relax and smile. Create an incentive for performance and improvement. This can be something as simple as lunch out with you or extra time off. Find out what motivates your family members and use it. When each family member enjoys playing an active role in the family business, they will strive to do better. Morale will stay high and everyone will find work more enjoyable. This will have a positive impact on the success of your family business.